Sea, the latter named after Sir Francis Beaufort (1774-1857), a British admiral. The Beaufort Gyre is almost completely covered by sea ice year round, except for its southern part, which becomes icefree in summer, typically in August and September. The anti-cyclonic circulation is typical for the upper 40-50 m and is driven by the persistent atmospheric high-pressure system (Beaufort anticyclone) centered over the Beaufort Sea. Since the surface circulation is largely wind driven, the Beaufort Gyre location and other characteristics are strongly dependent on the atmospheric pressure distribution over the Arctic Ocean. Particularly intriguing are annual late-summer reversals of Beaufort Gyre and the overlying sea cover, documented first with the help of drifting buoys and ice stations and confirmed later with satellite imagery. These reversals usually occur in August and are apparently caused by the reversed atmospheric circulation pattern (Ledrew et al., 1991; Warn-Varnas et al., 1991). The circulation in the southern Beaufort Gyre is more intense than elsewhere around the gyre. This southward intensification of the Beaufort Gyre along the north coast of Alaska is dynamically similar to the well-known western intensification of the Gulf Stream and other western boundary currents in mid-latitude oceans, the major difference being that bathy-metric variations take over the significance that variations in the Coriolis parameter assume in mid-latitude cases (Galt, 1973). The southern Beaufort Gyre is also strongly influenced by the Mackenzie River runoff. The Mackenzie River freshwater plume was observed to extend far north from the river mouth, well into the Beaufort Gyre. The freshening of the southern Beaufort Sea, especially of its shelf waters, might be partially accountable for the southward intensification of the Beaufort Gyre because the influx of fresh, warm (hence less dense) river water increases the density contrast between the onshelf and offshelf waters, which in turn leads to the intensification of geostrophic currents along the density front. Like any other large-scale anticyclonic gyre, the Beaufort Gyre circulation is virtually closed: the gyre is capable of retaining drifting objects for many years and even decades. This circumstance was especially beneficial for long-term drifting ice stations such as T-3, ARLIS-II, and North Pole (NP)-22. The ice islands T-3 and NP-22 completed two circulations in the Beaufort Gyre before they left the gyre. Each circulation took approximately ten years. Most drifting objects that escape from the Beaufort Gyre get caught in the Transpolar Drift and eventually leave the Arctic Ocean via Fram Strait into the Greenland Sea. Below the upper 50 m wind-driven layer with the anticyclonic circulation, the Beaufort Gyre circulation is cyclonic (counterclockwise) (Rudels et al., 1994). The southern limb of the cyclonic subsurface circulation is adjacent to the Beaufort undercurrent that flows eastward along Alaska's shelf break and slope (Aagaard, 1984). This undercurrent is approximately 70 km wide and extends down to at least 2500 m depth. Although its dynamics is not understood yet, the Beaufort undercurrent appears similar to the eastern boundary poleward undercurrents observed in other oceans and likely has similar dynamics. 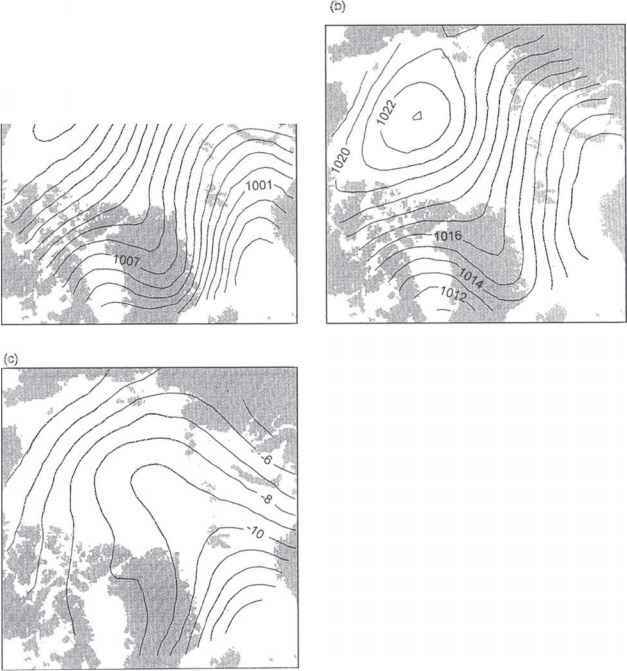 Dramatic changes have been observed in the 1990s in the Arctic Ocean circulation and frontal structure that have profoundly influenced the Beaufort Gyre (McLaughlin et al., 1996; Steele and Boyd, 1998). A front between Atlantic and Pacific waters, previously located over the Lomonosov Ridge, shifted to the Mendeleyev and Alpha ridges. Associated with this shift, a major reorganization of the large-scale surface circulation occurred, including a shrinkage of the Beaufort Gyre and an eastward deflection of the Transpolar Drift (Kwok, 2000; Maslowski et al., 2000). These changes are believed to be caused by semiglobal scale atmospheric variability described as the Arctic Oscillation or the North Atlantic Oscillation or, more generally, the Northern Hemisphere Annular Mode (see Climate Oscillations). While the observed shift might have been just one realization of a cyclical process and thus could be reversed in the future, other changes seem to be caused by the global climate change, which is known to amplify in the Arctic (Morison et al., 2000). In particular, the sea ice extent in the Beaufort Gyre decreased at a rate of about 5% per decade between 1979 and 1996 (Parkinsonet al., 1999), accompanied by a thinning of the sea ice cover (Rothrock et al., 1999). The Beaufort Gyre is populated by a multitude of mesoscale subsurface lenses with anomalous temperature and salinity (Manley and Hunkins, 1985). These lenses have a diameter of 10-20 km and are largely confined to 50-300 m depth. Most lenses have warm cores and rotate anticyclonically (clockwise), with maximum current speeds up to 30 cm s-1. Such eddies are quite ubiquitous in the Beaufort Sea, where they may occupy up to 25% of the available surface area, supplying 32% of kinetic energy in the upper 200 m of the Beaufort Sea. Cold-core eddies, albeit rare, have also been observed, having dimensions and kinematic characteristics similar to the warm-core eddies, but with different thermohaline signatures (Manley and Hunkins, 1985; Muench et al., 2000).